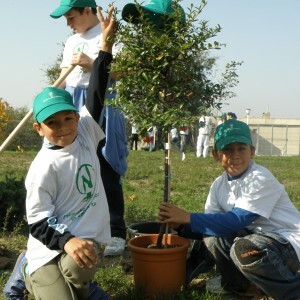 During October-November 2008, Nuclerelectrica organized the first social responsibility campaign, with the title “Welcome a tree in your family”. This campaign is trying, by tree planting actions, to increase the number of green places in the Cernavoda town from 8 sq. m per inhabitant to 20 sq. m per inhabitant, in compliance with the European Directives in force. After having announced the campaign through mass media, over the period between 13-14 October, pupils from three primary and high schools of Cernavoda got enrolled. The great number of submitted applications revealed the children’s enthusiastic attitude towards this action beneficial for their community. In all, 120 primary and high school pupils were selected. The campaign was launched on 17 October, when music and exultant cheers could be heard in the “Anghel Saligny “ High School yard. The event was open by Mr. Ionel Bucur, Deputy Director General with SNN SA, and by Mrs. Mariana Mircea, the mayor of the Cernavoda town, who encouraged the children to perform this ecologic activity and planted the first tree of this campaign, named “Friendship”. For two hours, 56 pupils planted young trees and shrubs that would grow and give the town more clean and healthy air. Each group could give a name to the trees they planted, committing themselves to take care of the young plants. The event ended with an outdoor aerobics show performed by a team of little professionals with the “Farul” Constanta sport club. The second phase of the campaign took place on November 4th 2008, in the yard of the nuclear power plant, where 45 pupils in the 5th grade at the local schools number 1,2 and 3 from Cernavoda got together for a new planting activity.